Buying Adobe Photoshop used to be simple. Even though Adobe would come out with an update every year or two, the application remained relatively the same. If all you wanted to do was basic image editing, you could buy Photoshop once, and go years without upgrading. Talk about the good old days! Today the options of how to buy Adobe Photoshop can be rather confusing. Thankfully, this guide will help you decide which version of Photoshop is the right investment for your photography needs. What’s the Best Way to Buy Photoshop? Photoshop has been an industry standard in photo editing for decades. Both professionals and amateurs look to Photoshop for any sort of advanced photo manipulation, from combining different images as layers, to extensive retouching, warping and color editing. However, since many photographers these days shoot their photos in RAW format and use a catalog-based workflow, it is not Photoshop but Adobe Lightroom that has become the initial starting point for most photo editing. 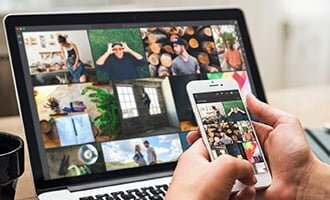 Adobe now offers Photoshop as part of a monthly subscription plan, known as the Adobe Creative Cloud Photography Plan. So what about if you don’t need Lightroom, and just want Photoshop. What are your options? All three of these subscriptions come with Photoshop. The ‘Photography’ Plan subscription is obviously the most affordable. 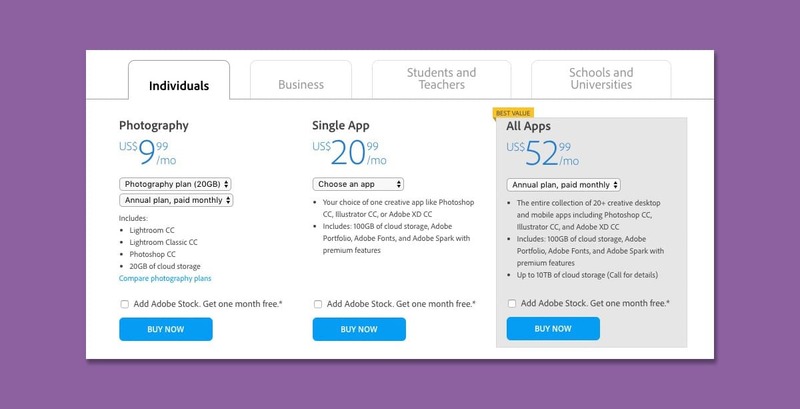 Here’s the first confusing part of Adobe’s subscription plans that you need to be aware of, especially if you assume it might be cheaper to just get Photoshop and not Lightroom. 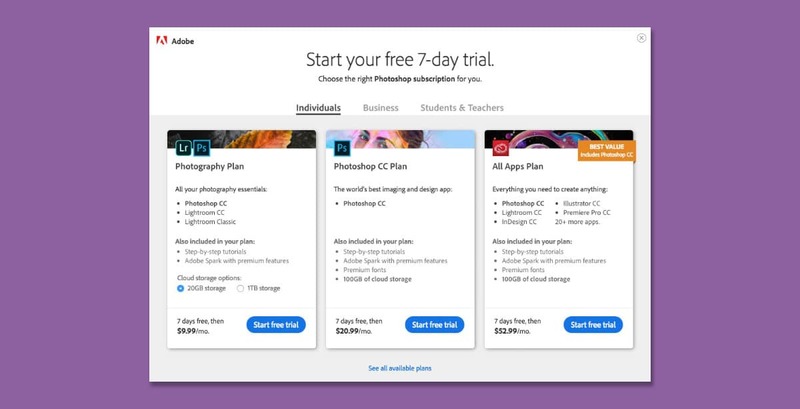 Simply put, Adobe has two low-cost subscription options: the Photography plan, and the Single App plan. However, the Photography plan is around $10/mo. while the Single Apps are around $21/mo each (latest, up to date pricing here). This means that if you try to get Photoshop without Lightroom, you’ll end up paying about $11/mo. more! Obviously, the best option is to just get Adobe’s Photography plan – even if you only need Photoshop, (or only need Lightroom), it’s the best value option. If you’re a multi-discipline creative or production company that needs a whole arsenal of Adobe applications, the full suite of Creative Cloud apps offers it all. The entire collection of 20+ creative desktop and mobile apps including Photoshop CC, Lightroom CC, Illustrator CC, and XD CC, 100GB of cloud storage, your own portfolio website, premium fonts, and social media tool. Does Creative Cloud All Apps include Acrobat? Yes! It includes all desktop applications that are part of the Adobe Creative Cloud Suite. What is in the Creative Cloud All Apps? What Adobe apps are free? Can I cancel Adobe CC? If you cancel after 14 days, your service will continue until the end of that month’s billing period, and you’ll be charged an early termination fee of 50% of your remaining contract obligation. For example, if you have 5 months of your contract left when you cancel and you pay $20/month, you’d pay 50% of the $100 remaining balance = $50 early termination fee. Remember that in all cases, it is possible to cancel your subscription within 14 days of making the purchase, to receive a full refund. Some photographers may be critical of Adobe’s subscription model, because their revenue has increased dramatically in the years since they first debuted the CC subscription plan. However, the main benefits of having a subscription plan, whether you have the basic Photography plan or the complete All Apps plan, is that you’ll always have the latest version of the apps, and the fact that Adobe releases major updates at a fast rate. This is not critical to everyone, but it is indeed very convenient to always have the latest, greatest, and usually the fastest version of Photoshop. If you’ve ever used Photoshop CS6 or any of the previous releases of standalone Photoshop, you’ll know that it would crash from time to time, and things would tend to slow down. I’ve found that with Photoshop CC, things seem a lot snappier in general, probably because of the frequent updates that serve to keep everything well optimized. If you want the latest features, (or new and improved versions of existing features) then the only way to get them is to via the subscription. Things like Live Blend Mode Preview, Content-Aware Fill, Multiple Undo and other genuinely useful features are only available in Photoshop CC. If you shoot raw, (RAW, NEF, CR2, ARW…) then before you even get your images into Photoshop, you must convert them from their raw format. So, you’ll need to use either Adobe Lightroom, or Adobe Camera Raw, to process your raw photos. 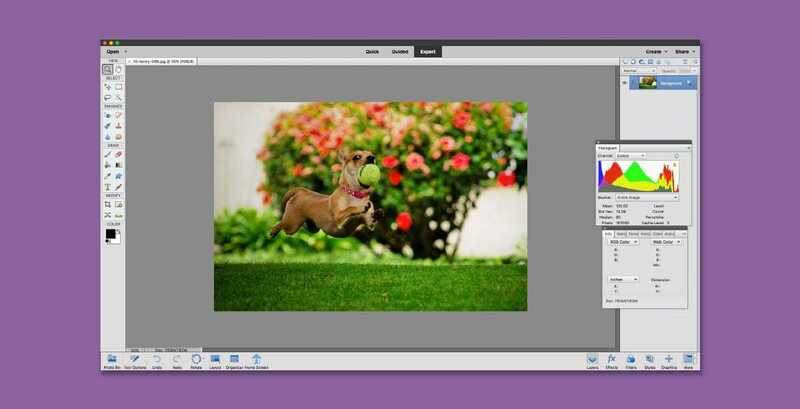 Adobe Camera Raw, which is also the stand-alone application known as Adobe Bridge, comes with Photoshop, even if you buy Photoshop without Lightroom. Unfortunately, Camera Raw (and Lightroom) need to be updated every time a new camera comes out, in order for the new raw file format to be supported. This means that you won’t be able to buy an old version of Photoshop and use it to process all your raw photos. You’ll need to get a CC subscription, or use Adobe’s DNG converter to make your new raw files compatible with your old raw converter. Photoshop CC on the iPad is coming soon, and it looks to be absolutely mind-blowing. 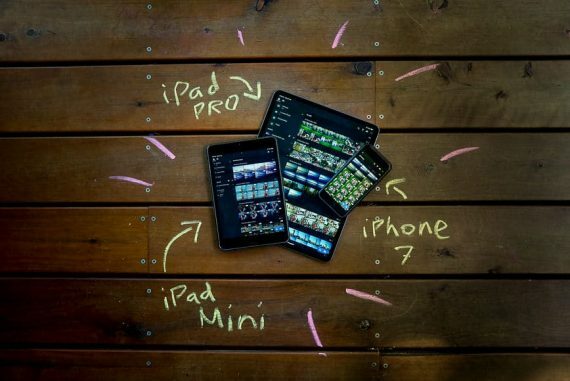 Being able to make all the same edits on your tablet as you can do on your desktop looks to be a game-changer for the creative industry. While the app itself will be free to use regardless of whether you’re a subscriber or not, the full syncing capabilities will not. In other words, if you subscribe to one of the Adobe CC Photoshop plans, you’ll be able to start off editing on your desktop, then pick up where you left off on your mobile device. Since the Photography Plan includes 20GB of free cloud storage, all your precious Photoshop (and Lightroom CC) files are automatically backed up online. If you’re like me and don’t want to have to remember to make manual backups, this feature alone is worth the cost of a monthly subscription. The 20 GB of cloud storage can also be upgraded to 10 TB for power-users. The only real con of purchasing Photoshop CC is the cost involved. Many people simply have an issue with adding yet another monthly subscription to their already subscription-filled lives. However, if you were the type of person who used to buy each one of the major updates to Photoshop, the cost actually evens out in the long run. Instead of paying a few hundred dollars every few years for the latest version of Adobe Photoshop, you pay a few dollars every month. One thing to note, however, is that if you ever stop paying for your subscription, you’ll no longer have access to the application itself – if you ever want to process old photos again, you’ll have to keep paying for the CC subscription. 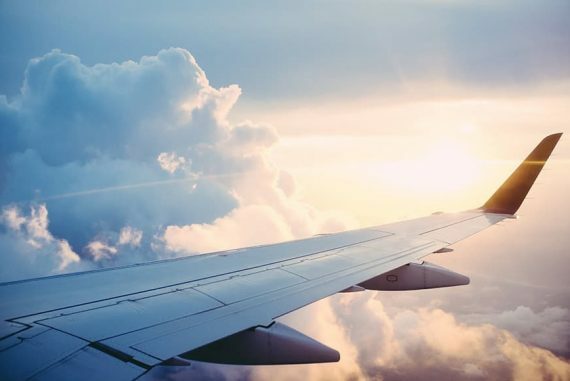 Adobe Photoshop Elements (2019) may look very different from the professional version of Photoshop, but the basic functionality is the same. As of 2019, Photoshop Elements is the most simple and affordable alternative to Photoshop that Adobe offers. Photoshop Elements is an up-to-date, “lite” version of Photoshop (see latest price here). If all you need to do with your images are simple tasks such as layers, brushes, or other basic adjustments, this is the most affordable way to still get (most of) the Photoshop environment, with a one-time payment. 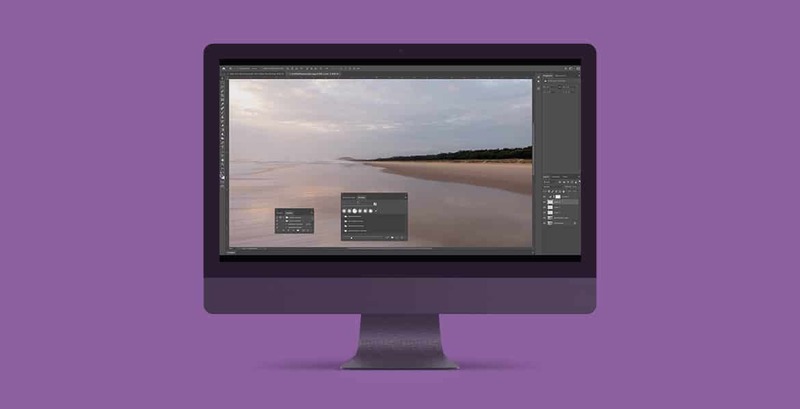 Buying a stand-alone, perpetual license of Photoshop comes with two simple, major benefits. If you only need the basic editing features of Photoshop, why pay a monthly fee? Photoshop Elements is great value for money, and a one-off payment. With a subscription model, your access ends when your subscription ends. If you want to be able to perform random edits to photos in the future without paying for a subscription or re-subscribing every time you want to edit photos, you’ll need to buy a standalone version of Photoshop. With Photoshop Elements, you pay once and own it forever. If all you need to do is basic layer masking and other types of simple edits, then you might not need the latest features in the current CC version of Photoshop. However, all photographers progress in their skill level over time, and eventually, they often realize that they need a certain advanced feature. Whether it’s for portrait retouching or nightscape photography compositing, you may eventually want the current version of Photoshop CC. If you buy Photoshop Elements, your only way to edit raw photos will be through Bridge/Camera Raw, which is admittedly rather clunky. You’ll be missing out on Lightroom Classic CC‘s desktop and mobile applications, which offer a great cross-device workflow for performing all manner of edits. Also, being able to cull, organize and even edit photos on a mobile or tablet (with Lr CC Mobile) is incredibly liberating, not to mention a lot of fun! 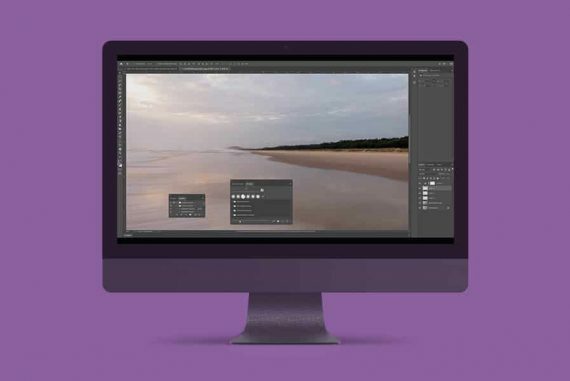 With Photoshop Elements, all your files are stored locally on your computer – there’s no ‘safety net’ of a cloud backup, nor cloud syncing, like there is with a Photoshop monthly subscription. 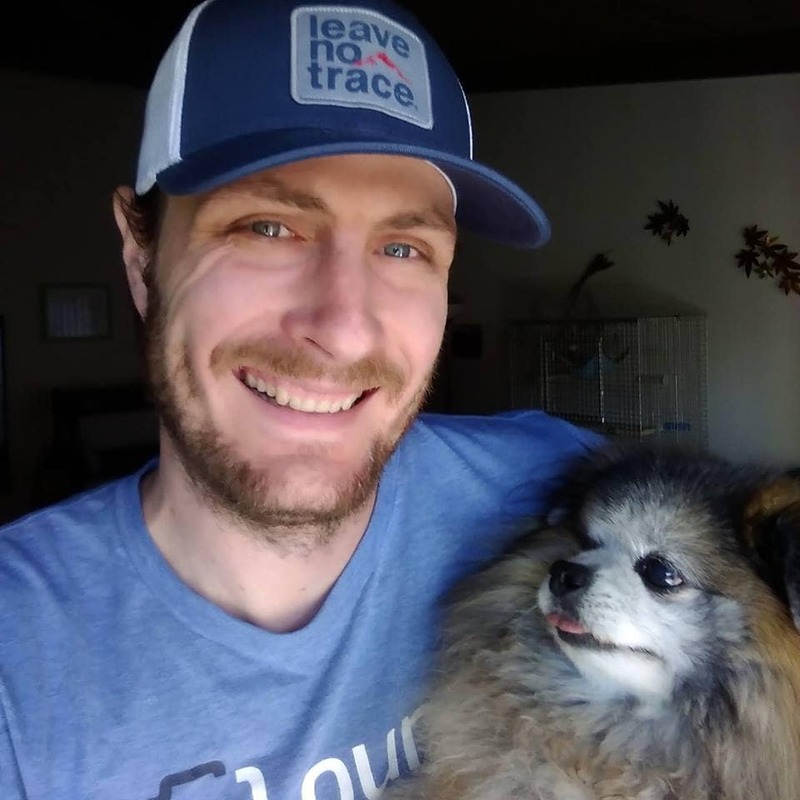 Obviously you can make manual backups to DropBox, or just to external hard-drives yourself, but having to think about this each time may impede your workflow. 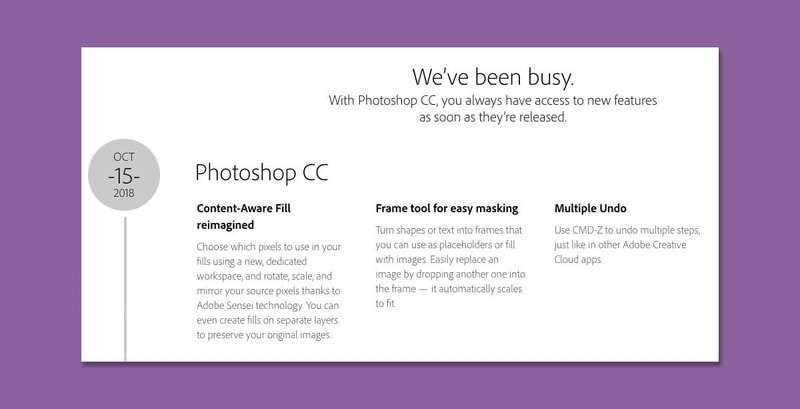 Adobe publishes major and minor updates to Photoshop CC on a regular basis. If you’re trying to decide between the subscription version of Photoshop CC, or the standalone Photoshop Elements software, this feature comparison table should help. Occasionally throughout the year, Adobe gives a discount on Photoshop and its other Creative Cloud products. Another option is if you’re a student or a teacher (check eligibility here). If eligible, you can save up to 67% on Creative Cloud products using this link. Finally, it’s worth mentioning that you can download a free Adobe Photoshop trial, or play around with any of the other Adobe products here. 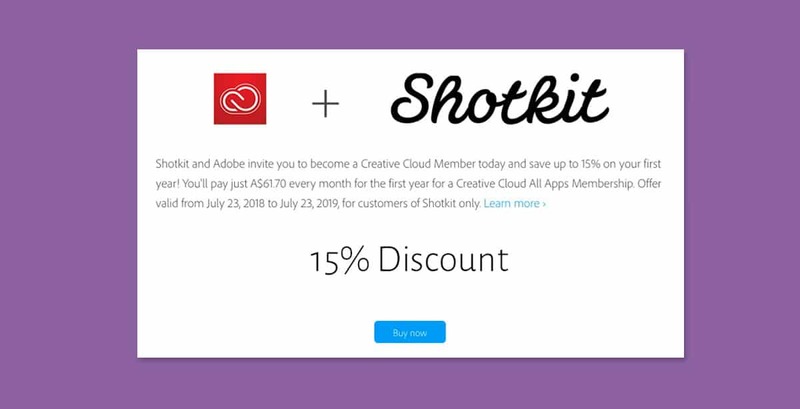 If you’re interested in a discount on the Adobe CC All Apps plan, Adobe has kindly offered all Shotkit fans a 15% discount on your first year as a Creative Cloud Member. Do you Qualify for an Adobe Student Discount? If you’re a student or teacher, you can take advantage of the best Photoshop discount currently available. 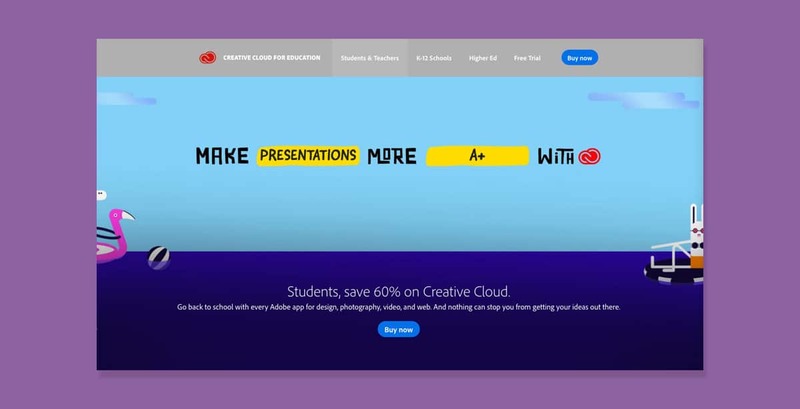 By using this link and selecting the ‘discount for students and teachers’ option, you could reduce the Creative Cloud All Apps plan from US$52.99 to $19.99 – a 60% saving! Bonus Tip: if you’re feeling a little ‘experimental’, you can always try and get the Photoshop student discount… even if you’re not a student or teacher! Plenty of online forums discuss how Adobe isn’t very thorough with its vetting process when people claim to be students – you didn’t hear it from me!! Yes, everybody knows that “pirated” versions of Photoshop exist. What people don’t realize is, these applications can potentially be quite harmful. Any time you install illegal software, you’re putting your computer, your images, and even your personal information at risk. In this day and age, it’s just not worth it. Just think of it like this – the price of an Adobe Photoshop/Lightroom subscription is just a few cups of coffee per month. In return, the stable, seamless user experience and always-current update environment are benefits worth paying for. Whether you’re a professional photographer or an enthusiast, you definitely shouldn’t be entrusting all your most precious memories to sketchy software. Anything could happen, including data corruption, and of course you won’t have the latest version of Photoshop if you buy a new camera. In summary, please do the right thing! Don’t take the risk! There’s simply no such thing as a ‘free Photoshop’, guys! If you plan to edit your images frequently, the Photoshop cost is more than worth it. The one official way to get a ‘free’ version of Photoshop is via the Adobe Photoshop Lightroom Trial, which is only available on the Adobe website here. The only drawback is that you’ve just 7 days to play around with the software, but at least it’s a fully functional version of Photoshop CC with all the latest updates. You can convert your trial to a paid Creative Cloud membership during the 7 day period, or after the trial expires. I recommend simply picking a week when you’ll have ample time to play around and take full advantage of the 7-day trial period. Adobe’s switch from a one-time, own-it-for-life software business to a subscription-based business model annoyed a lot of people. However, subscriptions seem to be the new way of life for a lot of products and services, especially those that we rely on for useful updates and quality support… and that’s what Adobe offers with Photoshop CC. At first, I must admit I was afraid that Adobe wouldn’t provide updates as regularly as they promised, and that the improvements wouldn’t be very exciting. Thankfully though, I was wrong – everything that’s been released or updated since I became a paying subscriber in early 2018 has been useful. As a Photoshop (and Lightroom) subscriber, I’m happy to pay for a subscription, for an effortless, stress-free experience, month after month. Click here to buy what I use every day.